This has been an action-packed week. We are in high gear working to release at least four new book by Gen Gen Indy. I’ve been busy writing two books simultaneously: Rifts® Vampires Sourcebook and Rifts® Black Market, while assigning artwork and coordinating work on several others. The writing on this book is shaping up nicely, and the ideas . . . you’ll love ‘em. The new material for Reid’s Rangers, Fort Reid, Camazotz and the Yucatan, werebeasts, hunters of Vampire Hunters, Erin Tarn and all the rest, will make gamers tremble. I’ve got Nick Bradshaw and Mark Dudley working on additional art. A July release! This great book is packed with source material that may make some guys squeal with delight like little children. 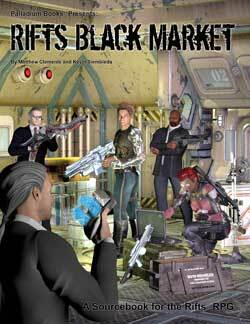 When I’m not working on Rifts® Vampires Sourcebook I have been working on Rifts® Black Market. Just yesterday, after I did work on the Vampire Hunters and Doc Reid section, I spent five hours going over Black Market O.C.C.s, the special abilities of Black Marketeers and the section on Black Market jobs. Earlier that day I met with Carmen Bellaire, who is writing up an armory of Bandito Arms weapons and gear. I then met with Julius Rosenstein who is wrapping up his writing of five Black Market O.C.C.s. Much like Rifts® Lemuria, I think the Black Market sourcebook contains a wealth of new data, ideas and source material that will make you say “wow.” That’s why we had to increase the page count. And, I might add, much of the material can be adapted to other game settings. I sent art assignments to Mike Mumah and Amy L. Ashbaugh for Rifts® Black Market earlier this week, spoke with both, and I’m ramping up to send the second batch out to them and other artists on Monday. Black Market will be a July release if it kills me! Wayne Smith and Alex Marciniszyn are fast at work editing the fun contributions to this issue of The Rifter®. I’ve assigned the artwork and sent agreements out to contributors a few days ago. In fact, I met with one of the artists this morning to provide him with some reference material. This is another great issue with material for Splicers® with Chuck Walton art, Rifts® Xiticix with Ben Rodriguez art, Techno-Wizardry across the Megaverse®, the second half of the Kezel for Heroes Unlimited™ and more. See the full description for it elsewhere in this Weekly Update. A July release! 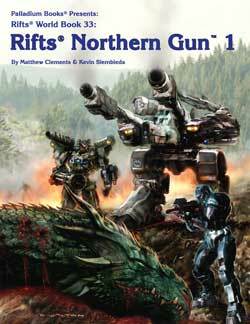 This is “part one” of a big project that, when combined with Rifts® Black Market, Northern Gun™ Two, Rifts® Vampires Sourcebook and Rifts® Megaverse® in Flames, is going to expand and transform the range of adventures across the North American landscape. The full magnitude of this combination of books will not be known until you see them. And as if that were not enough to get your hearts pumping – there are plans for Rifts® Lazlo as an early 2013 release (a book I have been secretly working to get into development for the last two years). Meanwhile, Charles Walton has been busy busting out more awe-inspiring artwork for NG-1. August release – in time for Gen Con. At least that’s the plan. Northern Gun™ One Hardcover. You have only this last weekend to order your Northern Gun™ One hardcover, NG-1 collector’s hardcover and PDF, as they are only available via the Northern Gun™ crowdfuning offer. And it ends on Monday, June 25, 2012. Northern Gun™ Two is the power-packed part two of the Northern Gun pair of World Books that will complete the picture of Northern Gun and fill in the details of an important force in the North American setting. Chuck Walton should blow us away with more art for this title when we meet Friday afternoon. With the Northern Gun ONE Megaverse® Insider crowdfunding offer creating buzz and excitement, sales across the board have been very good. Please, keep ‘em coming. And don’t overlook the nifty bookmarks, Chi-Town Library pencils, T-shirts and mugs. Rifts® Lemuria and Endless Dead™, along with Rifts® titles, Heroes Unlimited™ and Palladium Fantasy® in general, are seeing a lot of interest. The Northern Gun™ One hardcover, Collector’s Hardcover, PDF, and other items and services exclusive to the Northern Gun™ One crowdfunding offer are only available till Monday, June 25, 2012. This is your last few days to place your order for the limited time offer of the NG-1 hardcover, NG-1 Collector’s hardcover, PDF edition and other offers. NOTE: This current offer and next month’s Northern Gun™ TWO Megaverse Insider crowdfunding offer are the last two planned for this year. This one ends June 25, 2012. The value of crowdfunding. Crowdfunding gives Palladium Books a boost and the ability to release books with superior production value, and helps us develop other titles, do more reprints, advertising, reduce our debt load, and engage in other efforts to make Palladium strong. In fact, I paid down a big chunk of debt just this week, much of it going to Palladium’s talented writers and artists. Your participation is welcomed and appreciated, but please, do NOT overextend yourselves. Purchase only the Megaverse Insider items you want and what you can afford. NOTE: The special items like art prints that the higher levels of participation receive are NOT the same as those in the Lemuria Megaverse® Insider offer; they are completely new and different. How else would they be special? Each new offer will always be something new and special, unless stated otherwise. Crowdfunding fun fact. It seems like every time I turn around, I’m reading or hearing something new about crowdfunding. I was surprised to learn people are even going on line to crowdfund medical procedures and surgeries at websites like YouCaring.com, GiveForward.com and fundly.com. Wow. It is wild how fast this idea is going mainstream and being used by everyday folks as well as businesses. The Rifter® #49-52 are available on DriveThruRPG.com (issues #1-52). 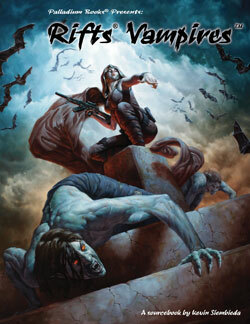 Sneak previews of Rifts® Vampires Sourcebook and Rifts® Black Market should be coming soon. We plan to add a few more items in the coming months that should please Palladium gamers. We are also continuing to move forward with plans for the PDF only editions of The Rifter® #0.1 and The Rifter® #0.2 – both are big, juicy digital editions of new, fan created material for the Palladium Megaverse® of games. Don’t forget, DriveThruRPG.com also offers the Rifts® and Palladium Fantasy® Game Master Kits (both written by Carl Gleba and complete with maps, combat matrix, character sheets, spell list, and 20 pre-rolled characters created by Julius Rosenstein; $5 each), and FREE Sneak Previews of Endless Dead™, Rifts® Lemuria, Rifts® Vampire Kingdoms™, and Thundercloud Galaxy™, as well as 90+ back stock titles, including back issues of The Rifter®, and first edition rule books for Rifts®, Palladium Fantasy RPG®, Heroes Unlimited™, The Mechanoid Invasion® Trilogy, and lots of other good things. ALL available as PDF downloads at reasonable prices. And there is MORE to come. The above are just the highlights of the week and things I thought you’d enjoy hearing about. Here’s some more. There is a lot boiling behind the scenes. Palladium’s agent, Mark Freedman of Surge Licensing, represented Rifts® and Palladium Books® at the Licensing Show in Las Vegas last week. Monday morning, I get a call from Mark shortly after he got off the Red-Eye. He was too wired to go to sleep and wanted to touch base with me. The call started something like this: “Kevin, it was unbelievable how many people know and love Rifts®.” What comes next? Hopefully follow-up telephone calls and licensing deals with several potential licensors who expressed interest at the event. Meanwhile, new book projects for 2013 are already being started. I’m looking into expanding the range of Palladium’s Robotech® license with Harmony Gold, we’re planning advertising and promotion, agreeing to convention appearances for next year already and making plans for Gen Con in August. I have been recently contacted by a few other creative types about other possible Rifts® and Nightbane® projects for development into different mediums. Film, television and videogames are all high on our agenda, but we’ll consider everything and are looking for licensing partners on all fronts. One talented gamer is looking into doing a Rifts® Character Generator, another is working on one for Heroes Unlimited, and I recently fielded a call about possible Facebook game development. ALL of this stuff is exciting, but in its infancy and may go nowhere. Still, it’s nice to see so much interest in Palladium’s intellectual properties. Oh yeah, our Gen Con e-mail blast to 70,000 gamers should go out today, and I’ll be working on some advertisements later today. Then it’s back to writing books. That’s the news and updates for this week. I’ll be working through the weekend on Rifts® Vampires Sourcebook and Rifts® Black Market, stopping only to call the last few remaining Lemuria Benefactors and Ultimate Insiders (some of you are hard to get hold of). We’re excited about new releases and future possibilities. I hope you are too. The Megaverse® Insider crowdfunding offer for Rifts® Northern Gun™ One enables you to purchase special, collectible and fun items and opportunities not available to the general public and help fund Palladium projects at the same time. Cat. No. 12011 – Inside Help (name listed in book): $5. Cat. No. 12012 – In Memoriam (name listed in book): $5. Cat. No. 12013 – A “Real” Character Tribute (your character’s name listed in book): $10. Cat. No. 12014 – Cyber-Insider PDF (digital file of the book): $15. Cat. No. 12015 – Palladium Insider (Hardcover color cover): $50. Cat. No. 12016 – Steel Insider (Deluxe “Steel Blue” foil HC): $75. Cat. No. 12017 – Steel-Plus Insider (Steel Blue Hardcover & PDF): $90. Cat. No. 12018 – Top Insider (PDF, HC, Steel Blue HC, & print): $145. Cat. No. 12019 – Ultimate Insider (PDF, HC, Steel Blue HC, dragon sketch in book, 4 b/w prints [different from those in the Lemuria offer], color print of wraparound cover + brief telephone call): $250. Cat. No. 12020 – Benefactor (PDF, HC, Steel Blue HC, black and white KS dragon sketch on a separate sheet of paper, signed and numbered color print of the wraparound cover, 8 prints [different from those in the Lemuria offer], Chuck Walton “original art,” and a long telephone call with Siembieda): $500. Cat. No. NG-UB1 – Ultimate Benefactor – Limited to One. SOLD. Such “crowdfunding” offers are a new way for companies to raise funds for major releases, like Northern Gun™ One and Two. Moneys made above and beyond our projected goals for each specific project are applied to paying off debt, increasing promotion and advertising, creating other new products and so on. Palladium is doing the Insider offer on the two related Northern Gun™ books as two separate crowdfunding offers, five weeks apart. The Rifts® Northern Gun™ One Megaverse® Insider offer is going on now and runs till June 25, 2012. The items offered are only available during this crowdfunding period. NOTE: All special items and prints are new and different from the previous Rifts® Lemuria Megaverse® Insider offer. Each new offer contains its own unique set of collectibles and keepsakes. These two (2), back to back Megaverse® Insider offers of related titles are the LAST TWO crowdfunding offers of 2012. Get ‘em while you can. The Northern Gun™ TWO Megaverse® Insider offer starts July 12. The Rifter® Number 59 examines the deadly, the weird and the magical. Much of the material is suitable for use in multiple settings or easy to adapt. Enjoy. Rifts® Xiticix Hivelands – Josh Sinsapaugh takes a dangerous look at the Xiticix threat, expanding hivelands and new Xiticix menaces. Palladium Fantasy® – Olympic-style games, adventure and intrigue on the Island of Lopan, by Paul Herbert. Splicers® – The Pack Mentality features the Packmaster and the genetically altered animals at his command. Written by Brandon Aten and Michael Orr. All Settings: Rules for Explosives for any Palladium setting – a very helpful article by Thomas Morrison. Various Settings: Techno-Wizardry Across the Megaverse® by Anthony Lovato. Various Settings: The Kezel™are weird, new superhumans for use in Rifts® Chaos Earth™, Rifts®, Phase World®, Heroes Unlimited™ and even Palladium Fantasy®. Part Two concludes the many super abilities. Written by Joseph Larsen. News, coming attractions, and more. Xiticix cover. 96 pages – still only $11.95 retail – Cat. No. 159. July release. Archie 3 and Hagan Lonovich are two of the most beloved villains (anti-heroes?) in the Rifts Earth setting. This sourcebook highlights their strange relationship, plots and blunders. One of which is inadvertently unleashing The Mechanoids® into the world! The Mechanoids have one driving goal: To destroy all humanoid life! This book has it all. Source material, the Mechanoids, new equipment, monsters, adventure and cryptic prophecies. The prophecies of the Seven Dangers. 20+ Mechanoids and their robot legion. Optional Mechanoids® Player Characters and character sheets. Archie Three and Hagan: Heroes or villains? The weapons and robot minions of Hagan Lonovich. New creations from Archie Three and Hagan, plus more history and insight about the unlikely duo. Cover and some interior art by Kevin Long. 112 pages – $16.95 – Cat. No. 805. Available now. The Coalition’s siege on Tolkeen has had a devastating impact on people across North America. 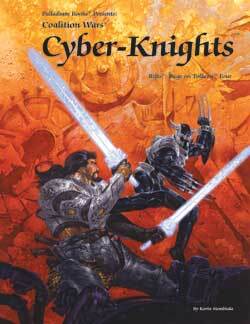 None have been more affected than the Cyber-Knights. This sourcebook reveals not only the history and secrets of the Cyber-Knights, but the schism the war has created among the fabled warriors. Cyber-Knight O.C.C., secrets and powers revealed. In-depth examination of the Code of Chivalry. Cyber-Knight Factions and rules of combat. Crusaders, Fallen Knights, Robber Knights and Despoilers. Lord Coake statted out, along with stats for other Cyber-Knights. 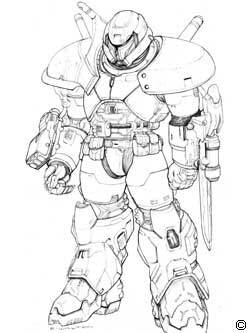 Notable weapons and armor of the Cyber-Knights. Story background, adventure outlines, ideas and more. Interior art by Freddie Williams II, Wayne Breaux Jr. and Mike Wilson. 112 pages – $16.95 – Cat. No. 842. Available now. In final production right now. Unknown to most humans, deep within Mexico the vampires have established entire kingdoms. There they live like tyrants and gods, dominating an underclass of cattle people used as slaves and food stock. Learn more about the vampires, their rivals, allies and the humans who willingly serve their supernatural masters for a chance to join the undead. A must-have guide for those who wish to travel deeper into the Vampire Kingdoms or play as vampires and their human minions. 128 pages – $16.95 – Cat. No. 884. July release. The Black Market is the most prevalent trader in weapons, magic items, drugs, and contraband outlawed by the Coalition. Explore the day to day business of the North American Black Market along with its smuggling routes, practices, policies and notable nefarious products and services. Learn about the five major Black Market factions in North America and foreign groups like the Yakuza, Green Scarf Sect and the Underground Railroads of Atlantis and the Vampire Kingdoms. The Five Black Market factions that wield the greatest power in North America: Bandito Arms, The Chicago Network, The Immaterial Hand, El Oculta, and Le Marche Noir. Black Market internal operations and security. A wide range of Big Bore weapons and other merc weapons. Black Market criminal assignments, jobs and mercenary bounties. Major Black Market smuggling corridors and routes through Coalition territory. Traveling Shows: Freak Shows, Medicine Shows and Circuses. Traveling Shows as fronts for the Black Market. Traveling Black Market Merchants, Market Towns and Market Outlets. How the Coalition States deals with organized crime, and information on the Coalition prison system and border security. Written by Matthew Clements, Taylor White, Kevin Siembieda, Julius Rosenstein, Alex Marciniszyn and Carmen Bellaire. Expanded page count – 192 pages – $24.95 retail – Cat. No. 886. Summer release. In-depth look at Northern Gun: its business operations and its community. Weapons and combat gear; new and old. Northern Gun character classes and more. The Ishpeming military and more. 160 pages – $20.95 retail – Cat. No. 887 – Summer release. 160 pages – $20.95 retail – Cat. No. 888 – Summer release. This is a great resource for getting out of print Palladium titles and other select books. We’ve made 90 titles available as PDF digital downloads from DriveThruRPG.com. This is a great way to try Palladium products and get access to out of print RPG source material. Some notable titles include. The Rifter® #49 through #52 just added – available now. Endless Dead™ is a new 96 page sourcebook that will send your Dead Reign™ campaign in new directions or add depth (and zombies). What are you waiting for? Order your copy today. 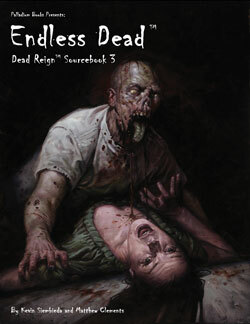 And if you haven’t taken a look at the Dead Reign™ RPG yet, but love zombies, you need to give this dynamic game a try. 96 pages – $16.95 retail – Cat. No. 233. Available now. ● New! Rifts® Pencil – Cat. No. 2561 – 50 cents per each pencil. People love this item and often buy them in sets of 10. Enjoy. ● New! Palladium Fantasy RPG® Coffee Mug – red on a black, 15.5 ounce mug – Cat. No. 2560 – $10.00. 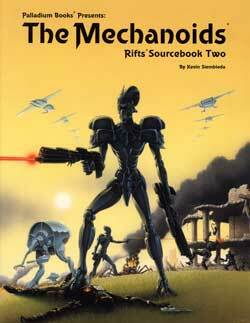 The following new Rifts® miniatures have never before been released by Palladium Books. Approximately 28 mm in size. Each figure is an unpainted, pewter miniature. Some assembly and cleaning may be required. Sold as a single, individual figure in a plastic bag and comes with a black, 30 mm or 40 mm plastic base. Prices vary according to size, but range from $6-12 retail. Sorry, not currently available in stores. Available only from Palladium Books. The following favorite Rifts® miniatures are back in stock. Some, like the Glitter Boy, have sold on the collector’s market for as much as $50-$120. They are being re-released for the first time in a decade. Approximately 25 mm in size. Prices vary according to size, but range from $6-20 retail. ● MI8031 – Rifts® Glitter Boy Power Armor – $20.00; this is a large, heavy figure. ● MI8033 – Rifts® Kydian Overlord (Atlantis) – $20.00; this is a large, heavy figure.